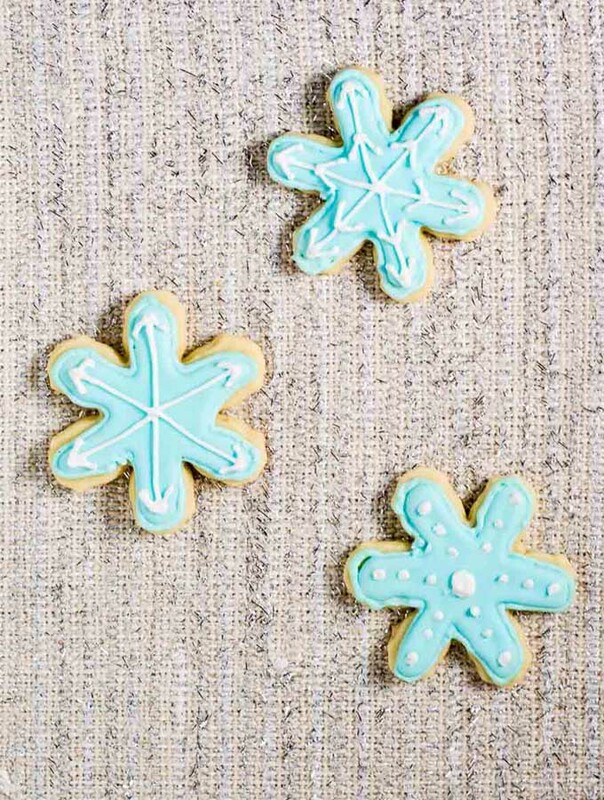 Let it snow with these adorable snowflake cookies! 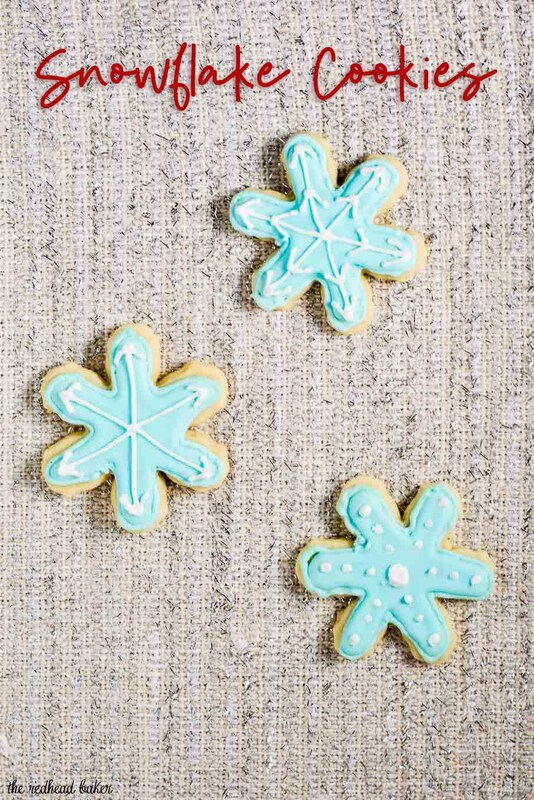 Perfect for any winter party, decorate each in a unique pattern, just like real snowflakes! Welcome to Day 3 of Christmas Cookie Week! Have you found a few new recipes to try yet? I sure have! To me, one of the classic Christmas cookies is the sugar cookie. Whether a plain round cookie sprinkled with sparkling sugar, or cut into shapes and decorated, these are a must-have at Christmas. I have quite a large collection of cookie cutters, everything from the usual snowflakes, hearts and pumpkins to lesser-used shapes like the Liberty Bell and a seashell. I had visions of starting a cookie decorating business after graduating from culinary school. Then I learned about cottage laws which govern in-home baking businesses, and I decided to nix that idea. I love dogs too much to go without owning one (or two) in order to sell decorated cookies. 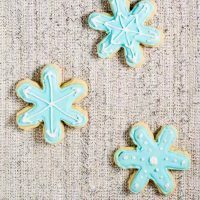 The thing I love about these snowflake cookies is that you can make them as simple or complex as you like, so they are great for beginners to practice on. You can even practice on a sheet of parchment paper before you commit your designs to a cookie. Royal icing does dry quickly, so it is essential to cover the bowl with damp paper towel when you’re not actively stirring it. 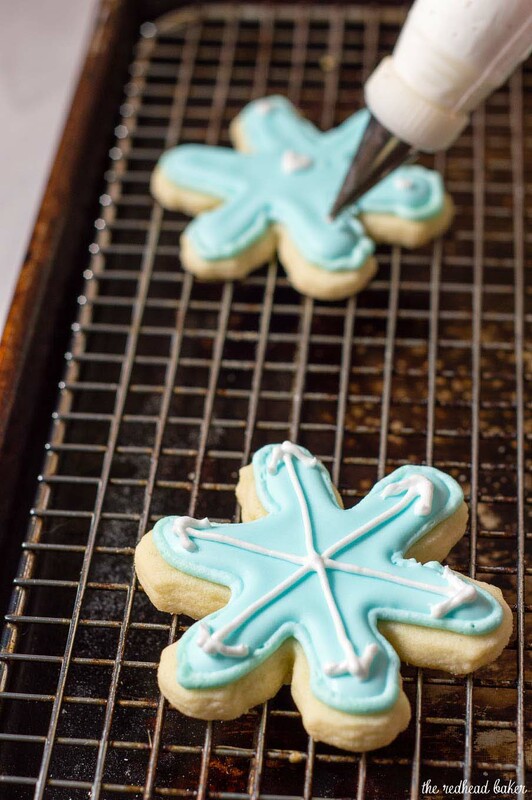 If you put your piping bag full of royal icing down to answer a phone call or grab a quick snack, wrap the tip of your piping bag in damp paper towel so it won’t dry out and clog the piping tip. The yield of this recipe will depend on the size of your cookie cutter. I got about 36 snowflake cookies using a 3-inch snowflake cookie cutter. Preheat oven to 350° F. Set out two sheets of parchment paper about the size of two baking sheets. In the bowl of your stand mixer fitted with the paddle attachment, cream butter and sugar until smooth, at least 3 minutes Scrape down the sides and bottom of the bowl, then beat in the vanilla and almond extracts, and the egg. In a separate bowl, combine baking powder with flour and add a little at a time to the wet ingredients and mix just until all of the flour is incorporated. Divide into two batches, flatten each into a disc, and place one disc on each sheet of parchment paper. Dust the tops of the dough discs and your rolling pin with flour. Roll out to 1/4 inch thickness. 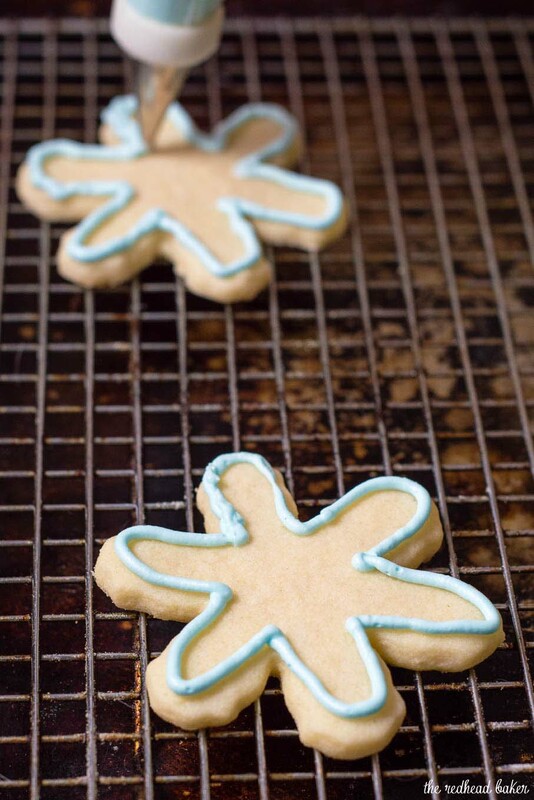 Cut out snowflakes with a 3-inch cookie cutter, spacing the shapes about 2 inches apart. 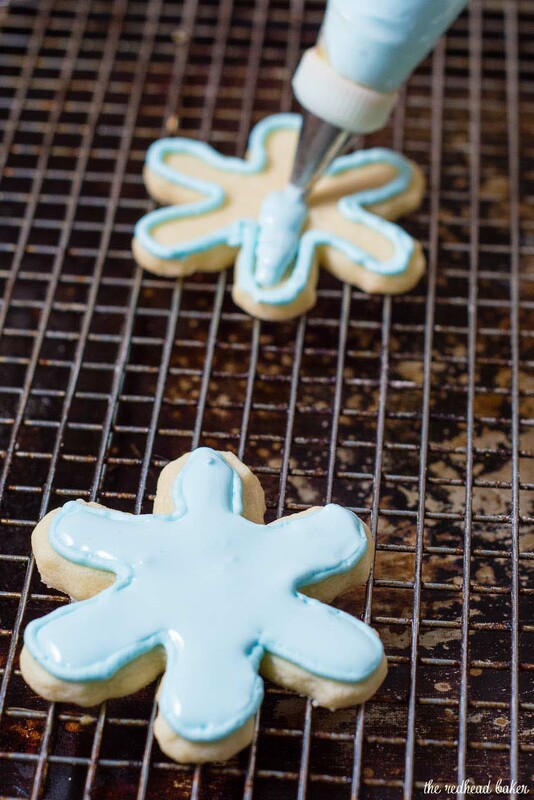 Remove the excess dough from between the snowflakes and place on a sheet of plastic wrap. 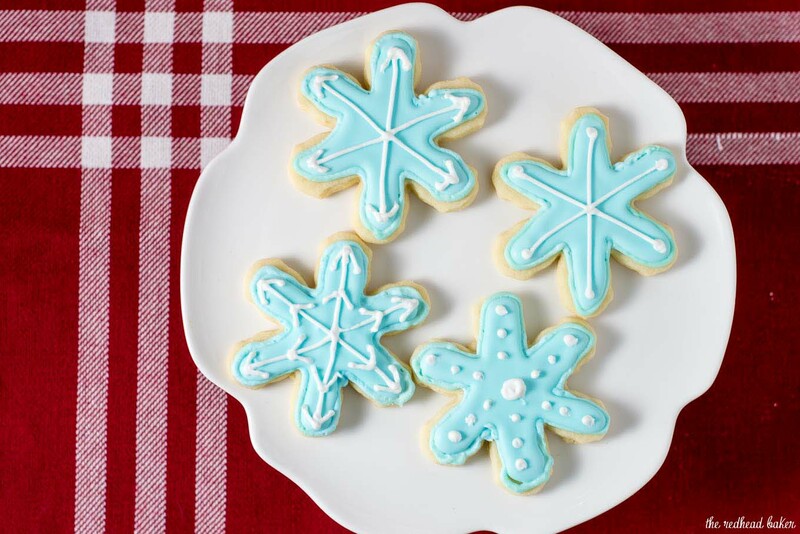 Move the parchment paper with the snowflake cookies onto the baking sheets. If your kitchen is very warm, you may want to chill the excess dough while your cookies are baking. Bake at 350 for 8 to 10 minutes. Let cool on the cookie sheet until firm enough to transfer to a cooling rack. Beat all ingredients together until icing forms peaks (7-10 minutes at low speed with a heavy-duty mixer, 10-12 minutes at high speed with a hand-held mixer). Remove one quarter of the icing from the bowl to a small container. Place a sheet of plastic wrap directly on the surface of the icing, cover the container, and set aside. If desired, color the remaining icing (in the cookies pictured, I used 1 drop of Americolor Sky Blue and 3 drops of Americolor Bright White). Place a sheet of damp paper towel over the bowl of icing. Prepared a piping bag with a coupler and a #3 or 4 plain tip. Fill the bag halfway with icing, and trace the outer edge of each cookie with icing (see photo). If your hand is shaking from the effort of squeezing out the icing, it's too stiff. Add a few drops of water, stir, and try again. Once all the cookies are traced, set them aside to dry. Squeeze any remaining icing in the bag back into the bowl. Thin the bowl of icing. Add a few drops of water at at time, and whisk to incorporate, until the icing is thin enough to drizzle off of your whisk. Prepare another piping bag with a coupler and a #5 or 6 plain tip. Fill halfway with the thinned icing. Flood the inner area of your cookies (see photo), using a toothpick to push the icing all the way into any corners or curves. Set aside to dry overnight. Once fully dry, prepare another piping bag with a coupler and a #2 plain tip. Fill halfway with the untinted icing that was reserved when the icing was first prepared. 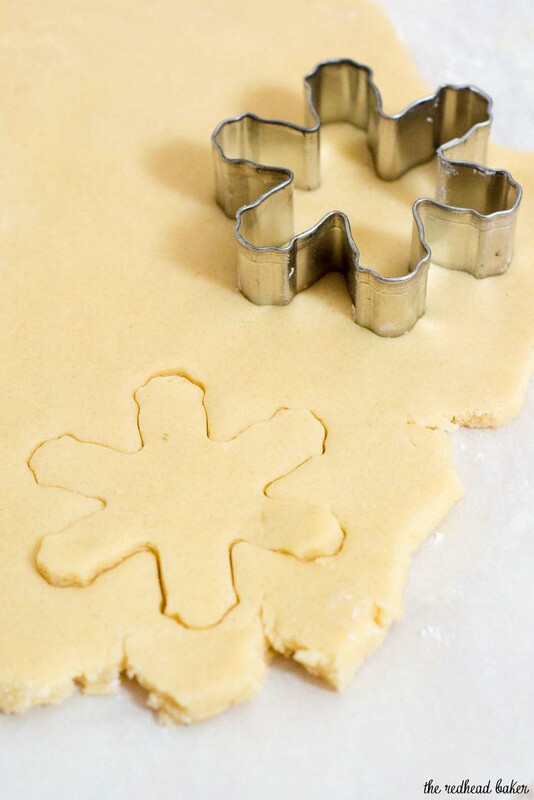 Pipe designs onto the surface of your cookies. Gently flatten any peaks with a slightly damp finger. Set aside to dry before storing. So pretty! I love the color and the accents. Perfect holiday cookies. Perfect blue for that winter feel!